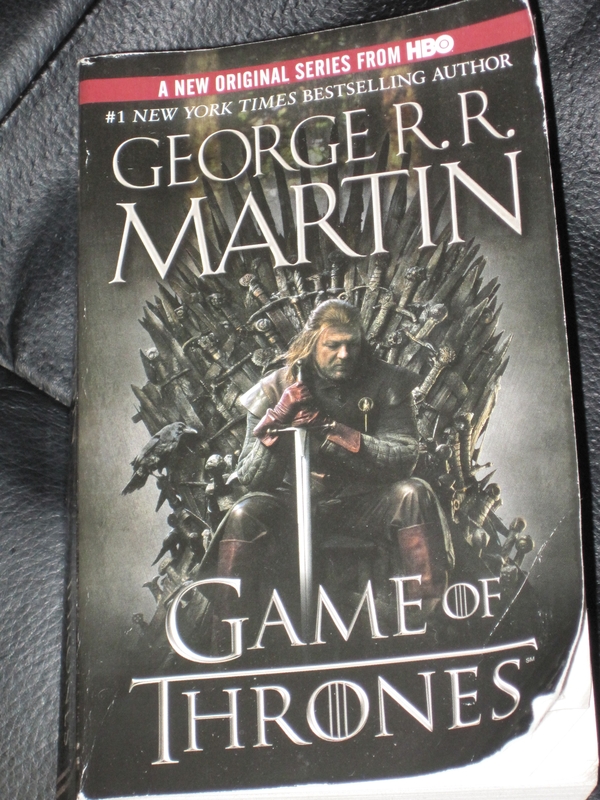 So, with the new series coming, Burgandy bought me a spontaneous birthday gift of “A Game of Thrones“, which I had not realized was actually the first book of the rather famous novel series “A Song of Fire and Ice”. ASOFAI is a very ambitious effort – a fantasy epic that actually has realistic consequences and a hard-edged realism. Actions have consequences in this series, and when people set off for vengeance for insults, you really see how the ordinary people (“smallfolk”) pay the price. These books are huge, but they are also page-turners: I have found myself reading them well into the night at times. Turnarounds and changes constantly happen, and bad things can happen to main characters up to and including death. This has kept me feeling addicted to the series, and reading and reading. The first three books are all tremendous and very, very enjoyable, though Martin is a bit too true to the realism part and has killed enough of the most likeable characters that the book is, I think, largely hampered – this is added to by the fact that the story was originally about a war for vengeance and is now winding down to the ‘the story after that war where the side you liked lost but, hey, another war might start soon, so at least you have that’. There are, however, a couple of major issues. The first issue is the fourth book – A Feast for Crows. Crows would be a very enjoyable book if I had not read the other three. However, as the afterword after the book states, the book got too long and so had to be split in half. Instead of just writing a two-parter in a normal way, the decision was made to divide the books by perspective and geography. This plus the attrition rate of main characters and bloat of brand new ones (four books in to the series? Strange, I thought) resulted in a book where basically all of the characters I enjoyed in the series were not actually in the book. I have to call foul on this. The second, and the reason this post is called ‘A Warning’ is that even though the fifth book is coming out this year, it has apparently been five years since the afterword to this book stated it would be out the next year. Though I can not truly appreciate the angst of waiting, having not lived through it, I know that the next book is not the last,the huge delay between it and Crows makes it seem unlikely I will ever see it. Thus if you are like me and want to see an ending to things, you may want to hold off a bit before picking these up, though on the other hand the first three books are excellent. These are lightly written page turners, which is a HUGE plus. You’re looking at about the same page count as the first few tomes of Wheel of Time, but a much, much easier and more fun story line. book 4 pissed me off so much that I told my friends to not even read it until they had book 5 in hand. I made it through a decent amount of WoT until it just seemed to run out of gas and I really began to doubt it would ever be completed. Always planned to pick it back up when/if it was finished. ASOFAI was much faster. Agreed on the fifth book – at least it has a release date now.